Grey Cabinets, bulky sinks and modern style cabinets are the latest trends in kitchen design this season. Get inspired by the latest trends in kitchen design by creating a unique kitchen using RTA cabinets. CabinetDIY's kitchen designers have one goal: To design trendy kitchens that are worthy enough to be the center of a dinner party conversation. As a leading RTA Cabinets wholesaler, CabinetDIY reveals the latest trends in kitchen and bathroom design and remodeling with the help of their experienced designers. See what's hot and what trends to look out for this season. White kitchen cabinets have been very popular in the past several seasons. They are flying off the shelves like hotcakes, and being used in many kitchen and bath design projects. However, Grey kitchen cabinets are starting to become one of the trendiest must haves this season. It is sophisticated, neutral and embraces a great deal of different color tones. Try mixing grey cabinets with a white kitchen island. It can also bring out the crispness of the white cabinets. Mixing and matching different shades of grey kitchen cabinets can also be an intriguing choice. Imagine this: Light grey surroundings with a dark grey kitchen island, finished with dark grey crown molding on the top of light grey wall cabinets. Can't go wrong with choosing any shade of gray this season, as gray is the new white when it comes to the latest in kitchen cabinet trend. Bulky sinks are also in. Whether it is a farm sink, apron sink, or industrial sized extra large sink. These sinks are on every housewife's favorites list. Here's a tip: Use a full depth wall cabinet as the sink base for the apron sink and add a wall filler to adjust with the depth of the apron sink. Then place a toe kick under the wall cabinet to match the rest of the base cabinets. This easy technique makes an apron sink base out of RTA (Ready to Assemble) kitchen cabinets. No need to pay big money for a custom apron sink base when you can build one out of RTA cabinets without breaking the bank. Modern European style cabinets is also coming strong this season. Its frame-less design with clean lines and sharp popping color, mixed with a metallic and glossy finish all scream modern kitchen design. When choosing this style of cabinet, make sure to select modern RTA kitchen cabinets with a plywood body box to ensure the durability of the kitchen cabinets and ever lasting modern style. 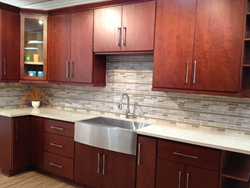 CabinetDIY would love to hear feedback on the latest kitchen design trends. Join their Facebook & Twitter conversation on kitchen and bath design. Request Free Samples and try out their Free 3D professional design for future kitchen remodeling projects.